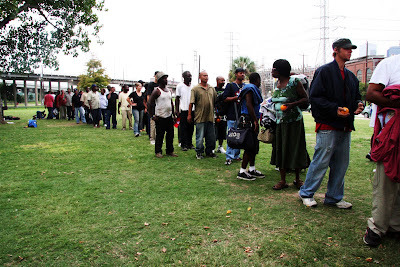 On Saturday, November 13, 2010, I will be “homeless” in Houston for one night along with thousands across the city. According to the National Coalition for the Homeless, each year 3.5 million Americans experience homelessness and on any given night, over 700,000 people are homeless. Studies indicate that children make up 23% of those experiencing homelessness while 40% of homeless men have served in the armed forces. Every night in America an estimated 100,000 veterans are homeless in the streets or housed in relief centers. Today is Veterans Day, but is this how America’s veterans should be living after sacrificing their lives? Take a stroll near Downtown Houston and you may run into 46-year-old James Francis, an unemployed homeless man who has been battling with a drug addiction the last ten years. “I usually don’t talk to people about what I’m going through, because I’m not looking for sympathy. I know I’m out here because of my mistakes, my addiction, and my lack of taking responsibility”, Mr. Francis told me when I spoke to him one-on-one last week. Approximately 15,000 homeless individuals in Houston live on cardboard makeshift beds, under freeways, and in shelters throughout the city. “It’s a serious situation not only here in Houston but all over America. We’ve become the invisible population. Who really cares about us? It’s really small organizations and churches that come out here to help us. I am determined to get back on my feet”, said Mr. Francis, who once worked as a construction worker. 60-year-old Ernest Gates, who has been on the Houston streets for 15 years with an alcohol addiction, says he is among the some 2,500 veterans of the armed services that make up 23% of the city’s homeless population. He’s unemployed and no family to call to upon. “I fell on hard times after losing my job and I have been living under bridges since. But I always appreciate when people bring something that will help no matter if it’s a sandwich or a dollar”, he told me as he nibbled on an apple given to him by a local church. “President Obama has made homelessness a priority in his administration in several ways. One way is he attached the issue to the stimulus and allocated $1.5 billion for homelessness prevention,” says Neil Donovan, Executive director of the National Coalition for the Homeless. Analysis by the National Coalition for the Homeless shows that some of the top reasons why people are homeless in America are foreclosures, poverty, less secure jobs, declining availability of public assistance, addiction disorders, and mental illnesses. What can any one person do to address this? My college classmate Noah Rattler, who went on an 1800 mile walk in 2007 from Houston to Los Angeles to raise awareness for homelessness, is spearheading the Bayou City’s annual Sleep Out on November 13, 2010. The objective of the Houston Sleep Out is to allow the general population to financially contribute to the fight against homelessness, while giving participants a small glimpse into a night in the life of the millions of people by spending a night outside on cardboard boxes in various parts of the city. The Sleep Out raised over $100,000 between 2008 and 2009 for SEARCH Homeless Services. I joined Noah and others last year at Sesquicentennial Park. While I was on my piece of cardboard wrapped up in a soaking wet sleeping bag, it was at that moment that it truly hit me. I had made the choice to be out there but thousands in Houston and millions in America may not have a choice. Just because a person is homeless does not mean that they are necessarily hopeless. Last year I heard stories from individuals who overcame homelessness and are now living prosperous lives. Honestly, I have experienced sleeping outside as a young boy. I’ve also stayed in the Star of Hope and the Salvation Army with my mother and little brother when things got rough. Those experiences have made me grateful for what I have today and have a heart not to forget about those who are less fortunate. This is why I’m so happy that the Nation of Islam’s Muhammad Mosque No. 45 will be one of the participating locations this year. Our bi-weekly feed the homeless outreach has been spearheaded by Sister Mattie X for the past ten years, and she will deliver the keynote address at the mosque’s Sleep Out gathering. “It’s depressing to see so many children in the streets when we’re out there. If we don’t do something, then nothing will get done,” said Sister Mattie. Other Sleep Outs will be hosted by My Fellow Man Alliance, Noah’s Kitchen, Andrea’s Hope, New Faith Church Young Adults and more. It’s not too late for you to host one. To read more go to www.hhhaw.us. Of course we all know that sleeping outside for one night will never give people a true picture of what it feels like to be homeless every day. The reality of it is the fact that we will have the luxury of getting back in our vehicles and going back to our families and fine homes the next day. We have a refrigerator full of food. This in no way diminishes the cause we are all coming together for to kick off the awareness week. Raising funds to give to those groups that are consistently helping the homeless and hungry is helpful. Providing jobs is helpful. Volunteering at shelters and food banks during and after the holiday season is helpful. Spreading awareness in newspapers, on radio shows, or on your Facebook and Twitter page is helpful. Every one can play a role. Will you?